ROME (CNS) — As the Legionaries of Christ started their extraordinary general chapter, the cardinal overseeing the troubled congregation said scandal had taken a toll on its finances, but that members had made progress in overcoming the moral and administrative legacy of their disgraced founder. Cardinal Velasio De Paolis, the papal delegate to the Legionaries, spoke in an interview with Vatican Radio broadcast Jan. 9, the chapter’s first working day. The cardinal had formally opened the gathering by concelebrating Mass with members of the congregation the previous evening. The chapter, expected to last six weeks, is the culmination of a reform process that began with a Vatican-ordered apostolic visitation in 2009. 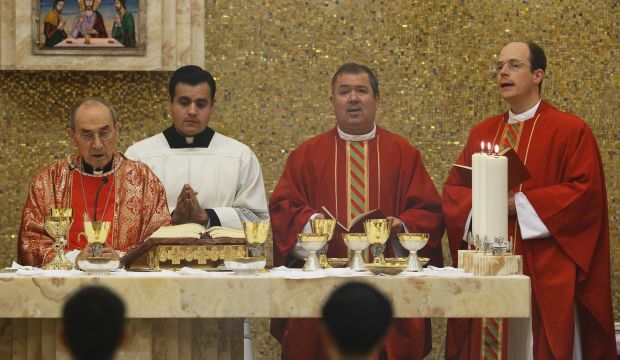 That investigation was prompted by revelations that the congregation’s founder, Father Marcial Maciel Degollado, had fathered at least one illegitimate child and sexually abused children. In 2010, the Vatican announced that Father Maciel, who died in 2008, had been guilty of “seriously and objectively immoral behavior” and “real crimes,” and had lived a “life devoid of scruples and of genuine religious meaning.” That same year, Pope Benedict XVI named Cardinal De Paolis to supervise the Legionaries’ reform. The 61 Legionary priests from 11 countries now gathered in Rome are supposed to select new leaders and approve a revised constitution, which has not yet been released to the press. The reference seemed to indicate that the revised constitution would permit Legionaries to choose their own confessors, removing a requirement that they confess only to priests chosen by superiors. In 2012, Cardinal De Paolis invited Legionary Father Alvaro Corcuera, who had succeeded Father Maciel as the congregation’s general director in 2005, to take a sabbatical until the general chapter, for the sake of Father Corcuera’s health. The cardinal said his first task in reform had been confronting the Legionaries’ rank and file with revelations about Father Maciel and their implications for the congregation. Acknowledging the challenge of identifying the congregation’s “spiritual patrimony” in light of its founder’s disgrace, the cardinal said the Legionaries’ charism is the same as that of their affiliated lay movement, Regnum Christi, which he described as “not touched” by the scandals associated with Father Maciel. Despite their troubles, the Legionaries remain an influential presence at the Vatican, among other ways through Rome’s Pontifical Regina Apostolorum University, which they run. In November, Pope Francis, who must approve the Legionaries’ new constitution before it takes effect, ordained Bishop Fernando Vergez, a member of the congregation, three months after naming him to the second-highest post in the office governing Vatican City.